Clasp/Buckle: Stainless steel Rolex deployant clasp stamped "P17" and "93160A"
To celebrate the 50th anniversary of its diving corps, the Italian State Police asked Rolex to produce this rare special edition, one of the last examples of a cooperation between Rolex and a police/military corp. 78 pieces were made in total, of which only 28 bear the certification number of the diver to whom it was given. In the case of this watch, this 'Brevet' number is 383, relating to diver Mario Gianbalvo, who was given the watch in December 2008. The emblem of the Italian Police Divers Corps - the octopus - is immediately apparent on the dial and is the origin of the "Polipetto" nickname for the model (Italian for "small octopus"). The caseback engraving is executed using high-voltage electro-gravure and it reads, on the present piece, "POLIZIA DI STATO SOMMOZZATORI 1958 - 2008 BREV.SMZ N.383'. The watch is offered in absolutely mint and unworn condition, and comes with its original box, guarantee, plastic guard for the bezel, chronometer tag, a leather folder containing a double-ended tool for adjusting the bracelet, extended link, a credit card sized Buehlman diving table, and a uniform patch, bearing the Octopus insignia. 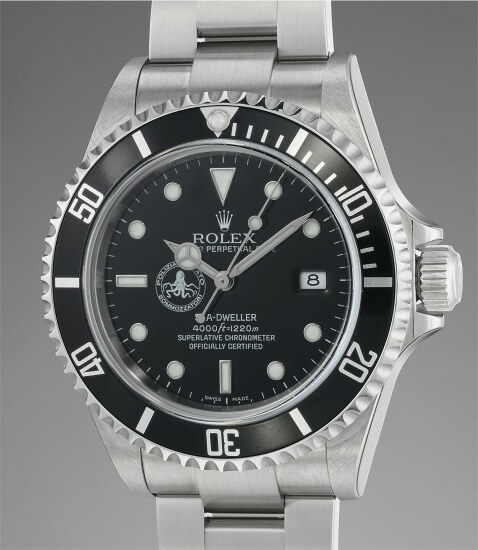 The Sea-Dweller "Polipetto" can indisputably be considered one of the rarest and most collectible Rolex "tool" watches of modern times. Highlighting its importance in the pantheon of highly sought-after Rolex watches, the Octopus is featured on the cover of Mondani and Ravagnani's seminal work "Rolex Submariner Story". To find a Polipetto, furthermore one of the 28 bearing the brevet number, in absolutely mint condition and complete of such a wealth of accessories is without a doubt an outstandingly rare opportunity for the collector of rare timepieces.